On Thanksgiving I got the chance to raise money for three charities: Stand up 2 Cancer, Feeding America, and the World Food Programme. All this by simply running and using a free app called Charity Miles. I bought an Android phone a couple of months ago and downloaded the free Charity Miles app. You select a charity and choose whether you are going to run, walk, or bike. The app keeps track of your miles. Every mile you cover leads to a donation to the charity of your choice. The results of your runs get posted to your Facebook page. I started out on Thanksgiving day with a three-mile run and took a little break to submit the results so Stand up 2 Cancer could earn the donation. The three miles I ran donated about seven minutes of cancer research. 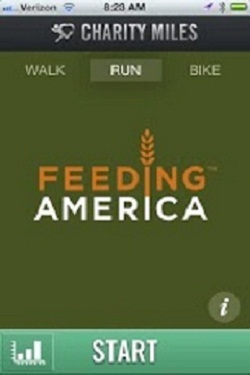 The next three-mile run was for Feeding America and this donated about eight meals. As a member of the Feeding America Blogger Council I was also busy getting an online petition set up to support America’s foodbanks. So please sign this petition. After another much-needed break especially considering the very hilly terrain I was running (the place is called Western Hills), my plan was to next run for the World Food Programme (WFP). My phone had a glitch so I lost about a mile’s worth. However, I did run a little over two miles after that, leading to a donation of five meals to WFP. I also was able to mention Charity Miles to a few people I passed along the way. I am happy to be nine of those miles yesterday and to raise money for causes I am very involved with. My column here, primarly about world hunger, is nearing its 500th article. I was glad to see Stand up 2 Cancer recently added to the Charity Mile list. I know how deeply devastating this disease is. My mother passed away from lung and brain cancer this summer. There are many other charities as well that you can help when you join. I never used a cell phone or Android before starting this, so for experienced people it should be relatively easy to set up. Article first published as Running Charity Miles to Fight Hunger and Cancer on Blogcritics.